Use our Car for your Driving Test! If you aren't comfortable using your own vehicle for your driving test, or if yours is not legal, safe and insured… you can use ours! 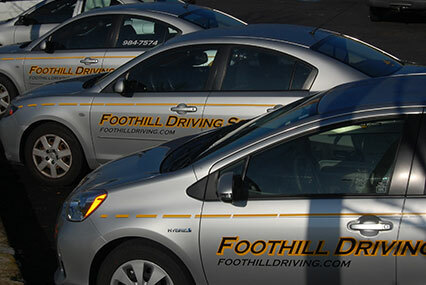 Please note: This service is only available to current or recent Foothill Driving School students. For the DMV behind the wheel driving test, you're required to bring a car that is safe and legal to drive. Also, it needs to be currently registered and insured. Most of all, you should be comfortable driving that vehicle. If you can't find a car that fits the bill, you can use our driving school car for the test. This session starts with a quick review of skills needed for the DMV test. The driving instructor then brings the student and car to the DMV to take the test.